In the tennis courts by the high school, cranes and other heavy equipment are staging to begin the disassembly of Portsmouth's wind turbine. The town has entered into a public-private partnership with a developer replace the current machine, installed in 2009, which suffered a major gearbox failure that took it offline. While it's a good deal for the town, it's still sad to see this device, which went up with such high hopes, coming down. You can find reasonably good translations online here and here and an idiosyncratic one by Robert Hunter here (For Hunter fans, there's an interview with him that touches on his process). At last night's meeting of the Portsmouth Town Council, representatives of maintenance contractor Lumus Construction delivered the news that the town's wind turbine generator needed a new gearbox, according to reporting in Patch. The replacement would require disassembly of the nacelle, and could cost the town over $1M. 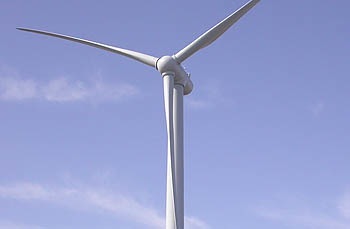 In a wind turbine, the gearbox connects the rotor with the generator. Like the transmission in a car, it converts the rotational speed of the blades to the appropriate RPM the generator requires. Inside the gearbox case are bearings that support the rotor shaft and gears to convert rotation, both of which are subject to variable stresses introduced by the spinning of the enormous blades. According to a source familiar with the situation, about three weeks ago, a periodic oil sample report showed "high levels of metal particulate," indicating an issue inside the gearbox, and the turbine was taken offline to prevent further damage. After reviewing borescope video, images of the oil filters, and oil sample analysis, the source said, both the gearbox manufacturer and Lumus recommended replacement. Yes, it's a serious failure. But it is neither completely unanticipated, nor is it necessarily indicative of hardware defects or failures in oversight. Cars have been around for a hundred years, and there are still transmission repair shops that do a good business. Gears and bearings all eventually wear out. That's an unpleasant fact of life. Was the town over-optimistic in thinking we'd get something more like the industry's expected 7-to-11 years of mean time to failure? Yeah, probably. It's a bad situation. We need to analyze the problem, assess our options, and determine the best way forward. And all the hysterical haters who are – literally – crowing over the failure in the cesspool of comments on Patch should ask themselves: How is what I am doing helping our Town? According to a story posted on ProvidenceJournal.com, the RI Public Utility Commission has ruled in favor of Portsmouth in an action that questioned the rate the Town received from National Grid. According to the article, the PUC ruled "that the Town of Portsmouth has not, and is not currently, receiving an excessive rate for the output it sells back to National Grid." Wind Fest at the turbine! Come on down to the Portsmouth Wind Turbine for the Wind Fest from 10:30am-1:30pm today near the basketball court at Portsmouth High School. Read more about Wind Fest! It's the Portsmouth Wind Turbine's first birthday, and People's Power and Light is throwing a party. This Saturday, May 22, from 10:30am-1:30pm stop by the basketball court near the turbine (at Portsmouth High School) for some clean-energy fun and games. Get their early for free refreshments and t-shirts, and enjoy art projects, games, and folk music. You'll be able to talk with the Portsmouth Sustainable Energy Subcommittee to hear about how they made it all happen, you'll get to see the turbine up close, and you can chat with the good folks from People's Power and Light to hear how you can enroll in their GreenStart program to support more projects like this. Today marks the one-year anniversary of Portsmouth's wind turbine generator going online, and according to figures from the Planning Dept., it is running at 110% of estimated production, and has generated electricity worth more than $550,000 for the town. "Needless to say, we are very pleased with annual production," said assistant town planner Gary Crosby. "February, 2010 was our fourth month in a row of 100% availability with zero down time. As you can see from the figures, we have really hit our stride." Portsmouth Economic Development Committee (PEDC) Chair Rich Talipsky agreed. 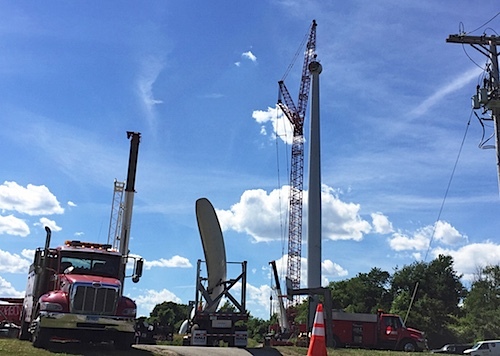 "As expected, the wind turbine had some adjustment issues and operational glitches in the first six months, but after the adjustments were made, the project has exceeded all expectations both in reliability and power output." 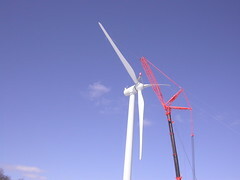 The wind turbine was approved by a 60% majority of Portsmouth voters in 2007, and the project was planned and managed by the citizen-volunteers of the PEDC Sustainable Energy Subcommittee: Talipsky, Gary Gump, Bob Hamilton, and Doug Smith. Reflecting on the past year, Talipsky said, "The project team members often look up at the wind turbine and say, 'How did we do it?' And, when we thought about it, we came to the realization that we had developed the right chemistry between the citizens, the Town leadership and the project contractor that enabled an honest dialogue. It was the heart of a working relationship that brought potential problems and issues to the forefront early so that they could be resolved." Now, when you drive along East Main Road, it just looks like part of the scenery. A year later, nobody remembers the delays as shipments were held up by load limits on highways, or the March snowstorm that brought construction to a halt, or the tense moments of watching the wind speed gauge for a break to hoist the final sections. Talipsky admits that the PEDC does miss the drama, a little. "After laboring on the project for over four years, it was hard for our team to let go of our fledgling project and turn it over to the Town for continued management. But, that was the way we had planned for it to work. The wind turbine generator was to become a normal piece of Town infrastructure managed by Town personnel with an Enterprise Fund that would provide accountability on the costs and revenues of the project." And with a half-million dollars of revenue already in the town's coffers (minus, of course, bond payments and maintenance), the team can feel good about what they've handed over. "We could not have hoped for a better first year," said Talipsky. See a collection of all prior coverage here. On Monday, Gov. Donald Carieri signed legislation sponsored by Rep. David Segal which enables renewable energy producers to get more credit for the electricity they put back on the grid. The bill overrides rulings by the Public Utilities Commission (PUC) which meant municipalities like Portsmouth, with their own turbine, could only offset their top 5 electric meters. According to information made available by the Governor's office, the new law allows utilities to write a check directly to the project owner or municipalities can now opt to offset their top 10 meters. Rich Talipsky, chair of the Portsmouth Economic Development Committee (PEDC), expressed satisfaction with the legislation. "It is amazing how complicated something gets when a simple bill gets in the hands of the PUC, as we saw with their interpretation of last year's bill that limited our credits to only that used on five Town electric meters," said Talipsky. "I hope that the bill just signed by the Governor leaves no question in the eyes of the PUC that Portsmouth will receive full credit for all the energy the wind turbine produces rather than being limited to credit on some arbitrary number of electric meters." 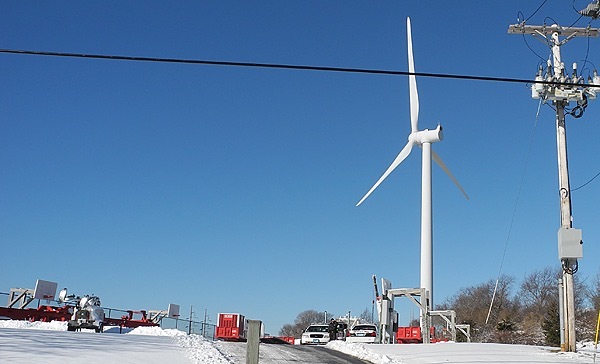 According to figures published on the PEDC Web site, Portsmouth's wind turbine, in the first four months of its operation, has produced over 1,000 megawatts of electricity, which translates to $150K in revenue to the town. "Portsmouth went to a lot of trouble in establishing a Wind Turbine Enterprise Fund to make sure the turbine's costs and revenues were properly and equitably managed," said Talipsky. "The new legislation option for the power company to 'write a check' to the Town for all credits and let the Town manage the credits is exactly what we had planned on all along."